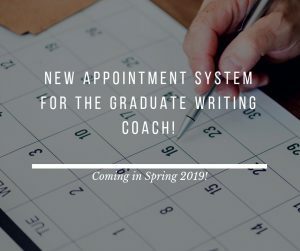 Starting Spring 2019, requests for appointments with the Graduate Writing Coach will be switching from Doodle to Google Calendar. This will allow students to more clearly see the available appointment times and allow for instant confirmation of requests and/or cancellations. 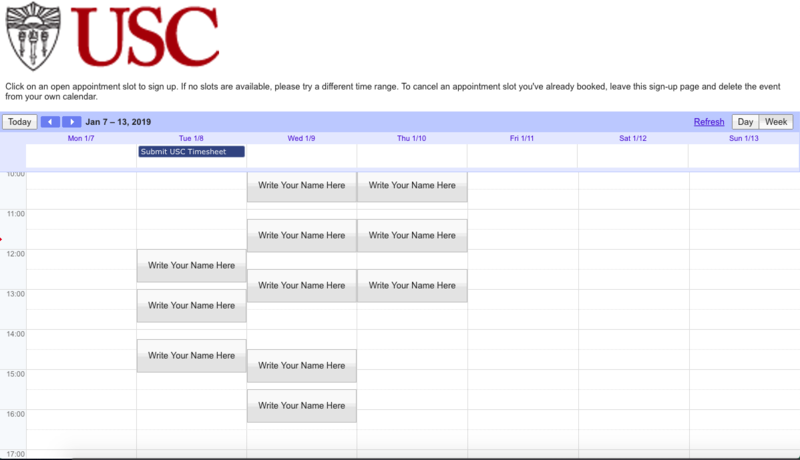 The new appointment system will require you to sign in to your myUSC account to view available appointment times. Open appointment slots will say “Write Your Name Here.” You will not be able to select times that are not offered as appointment slots. If you need alternative meeting times, email me directly. 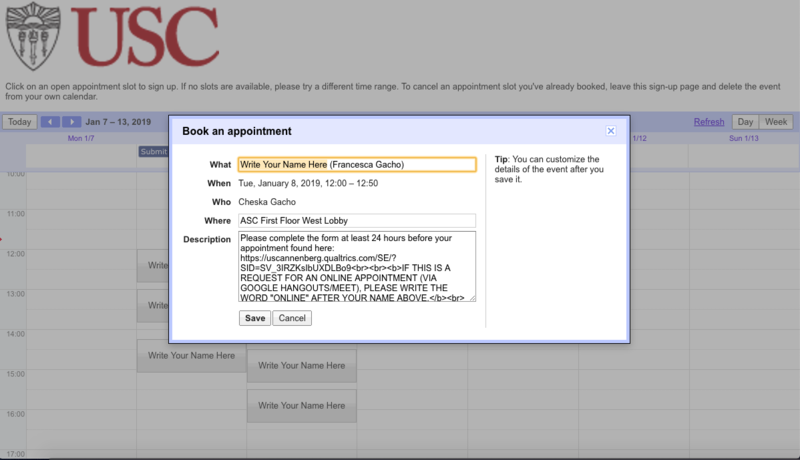 To select an appointment slot, click on the time and date of your choice and type your name into the “What” field. In the description, you’ll see the details of your appointment. If you prefer to meet online, write “ONLINE” next to your name. Click “Save” to set your appointment and the appointment date and time will sync to your USC Google Calendar. 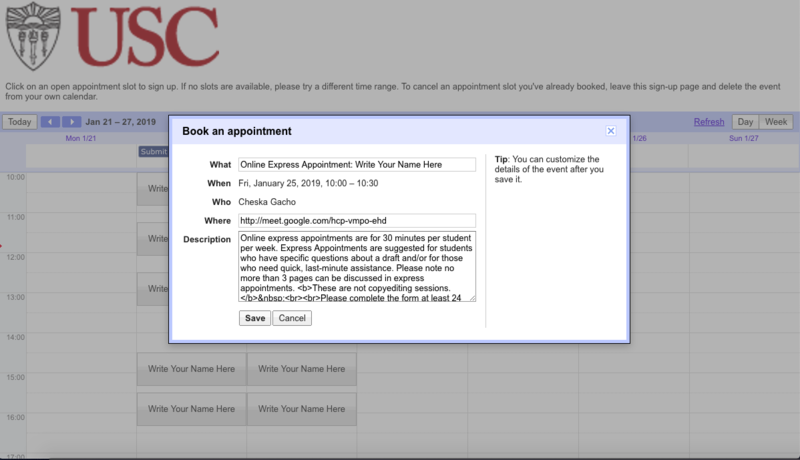 New appointment option: Online Express Appointments. In addition to in-person and online appointments, starting in Spring 2019, online express appointments will be offered. These express appointments will be held via Google Meet (meeting links will be on the appointment details when you book your appointment. See screenshot below). Each express appointment will be 30-minutes and no more than 3 pages of text will be discussed. These are ideal for students who are seeking for a last-minute appointment and/or for those who do not need a full 50-minute appointment. As always, Pre-Session Forms must be completed at least 24 hours before your appointment. To see the available appointment slots, click here. I recommend you bookmark this page for easy access. This entry was posted in GWC, news. Bookmark the permalink.